Over the years, we have learned a great deal about pain management for our pets. 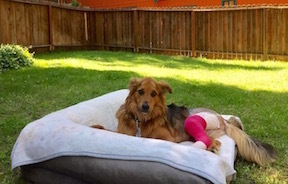 Pets can feel pain during and after surgeries, with illness, and in old age. We can control this pain with medication. At Sierra Veterinary Hospital, we offer pain medication to our client’s pet before, during, and after surgery. We help pets whom are suffering from debilitating illness by lessening their discomfort with pain reducing medications. We care for older pets with arthritis and joint pain by prescribing NSAID’s (Non-Steroidal Anti-Inflammatory Drugs), as well as other medications such as omega fatty acids, joint supplements, and other pain control medications. Quality of life is important and watching your elderly dog catch a Frisbee or your senior cat play with a ball of yarn is joyful. As a pet owner, we know that you want your companion to be comfortable, and we will help you to achieve this goal through pain management for your pet.